October 25, 2018 Visit from Minister Ciaran Cannon, T.D. 2016 Christmas Dinner & Dance, December 11th. Vision: The Emerald Isle Seniors* Society - established in Toronto, Ontario in 1996 - was formed to promote and assist all senior citizens* of Irish heritage in celebrating life now in Canada together with passing on the culture of all parts of Ireland. Mission: To establish, maintain and operate an Irish senior citizens' centre. In doing so we will provide our members recreational, social and educational activities including those of Irish theatre, music and culture. Goals: The Society is formed as a senior citizens group having both non sectarian and non political views. We will address the danger of social isolation and vulnerability to exploitation, particularly among seniors on low fixed incomes. 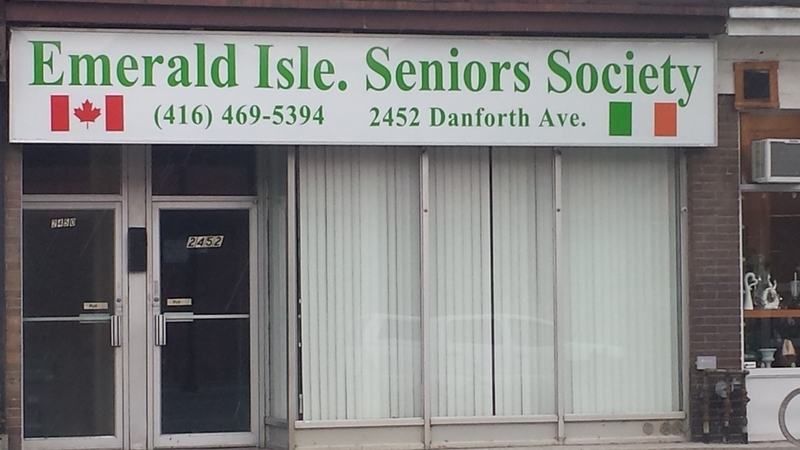 Our new location on Danforth Avenue, Toronto just west of Main Street and the TTC subway station. Meter parking on street or car parks nearby. Fáilte go dtí ár suíomh gréasáin nua - Welcome to our new website. We have completed our first re-vamp of our website based on suggested offered. We welcome any further suggestions for articles and other improvements you would like us to make. Please send your suggestions to our secretary- click e-mail address in "Office & E-Mail" section above. We welcome new members 55 and older and all are welcome to drop in and see what we are all about. On Tuesday, lunch is served at 12:30 p.m. Join us for the best cup of tea in town. On Wednesday, line dancing class is held from 12:00 to 1:30 p.m. Come out and practice your two-step. In addition to our own functions, the club is used by various Irish groups interested in promoting our culture. On Wednesday, Maureen Mulvey teaches Irish dancing for children from 5:30 to 7:30 p.m. After 7:30. she teaches ceili and set dancing for adults. \On Thursday evenings, you may be interested in attending Irish language classes. We are grateful to the Irish government for their financial support in contributing to the operation of the Emerald Isle Senior Society. We are also grateful to L.I.U.N.A. Local 183 for their generous donation to our organization.